Many passengers were apprehensive about our last night at sea. The concern was that we might experience winds similar to those of the first night. We were pleasantly surprised with calm seas. The only sensation experienced was the on-shore swell common to any sea coast. These caused a slow but pronounced port to starboard rocking motion. 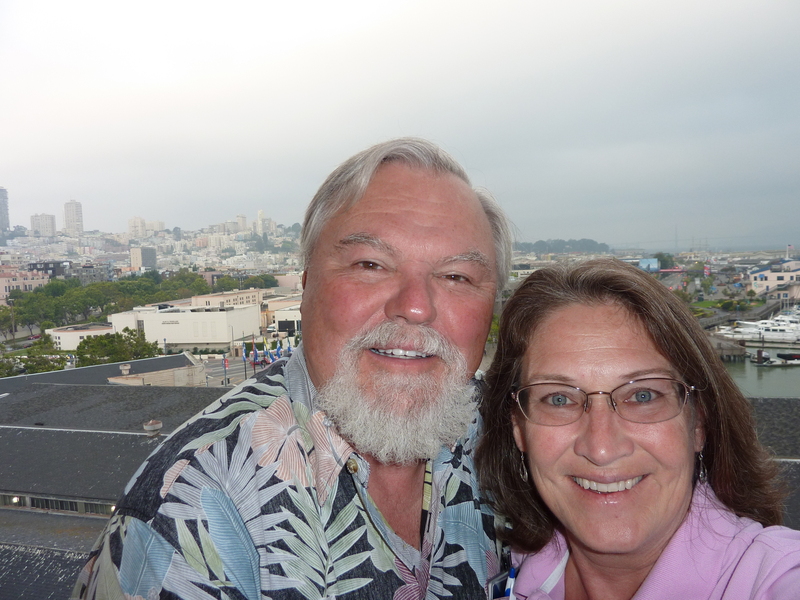 Cathy and I wanted to be on our balcony while going under the Golden Gate. We checked the daily newsletter, and asked four or five crew members. “What time do we go under The Golden Gate?” The consensus was between 6:00 and 6:30 a.m. We were scheduled to dock at 7:00 a.m.
For the only time on the cruise, I set up a wakeup call, 5:30 a.m. The call came. We were up and out of bed quick as a shot. I threw open the curtains, stepped out on the balcony. To our amazement we were next to Alcatraz. It was foggy. We couldn’t even see the Golden Gate. After an early and leisurely breakfast, we cleared out of the stateroom and prepared to disembark. We met our friends Mike and Maddi Misheloff waiting on the sidewalk in front of Pier 35. The Misheloffs hadn’t eaten. Maddi said, “We haven’t eaten. Do you want to get breakfast? We know this great place, or do you want to go straight home?” Good thing we ate a small breakfast. It was a short but hectic drive to 6th Street. 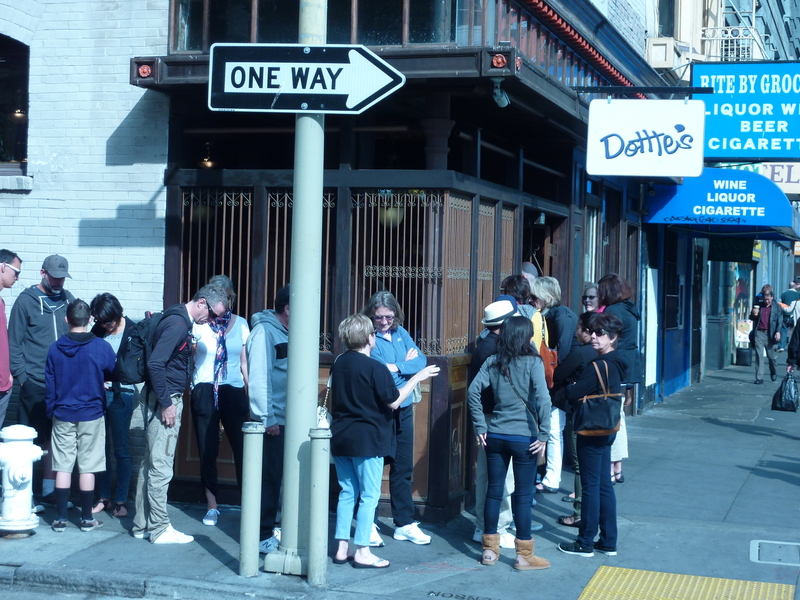 The restaurant was in a new location so the Misheloffs were not positive where. We parked and tried to feed the meter. Wow, it was five minutes for a quarter. We had less than a dollar’s worth of change between us. Cathy went into a bodega for parking change. “If you buy something, I’ll give you four quarters. No more.” She bought water. Now we had forty minutes on the meter. I offered to come back and feed the meter after we got to the restaurant. We walked east. A young lady heard us talking and told us to go four blocks the other way. 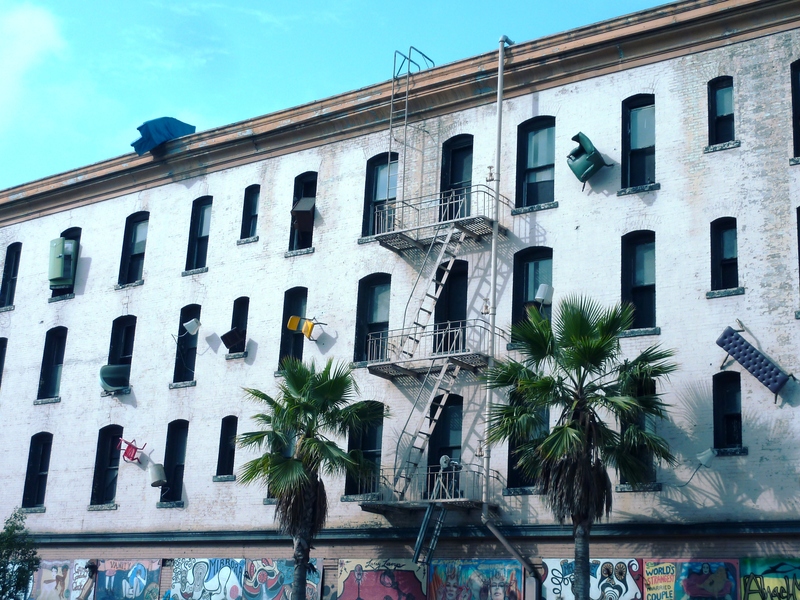 This old building had pieces of furniture mounted to the walls. Two blocks up we found a free parking spot on a side street. Mike and I went back for the car. After making the mandatory three turns, we got to the spot and parked. Both our phones began to ring. “Hey, there’s a free spot up here beside the café.” Another odyssey. We arrived only to find that a third of the parking spot was marked with no parking signs for construction. I had Mike pull as close as possible to car in front of him. I moved the no parking signs a few feet back.We looked legal. They had muffins the size of small cakes and a dozen specials. What a place. Mike, Maddi, and Cathy are discussing the specials. Later in the day, our daughter Jennifer and her boyfriend, Brandon Witt, stopped by the house for dinner. I had two great steaks ready to BBQ but there wasn’t enough for the four of us. So we decided on Frankie, Johnnie Luigi Too! It’s about a mile from our home. On the way I tried to explain to Jen and Brandon where we had our second breakfast. 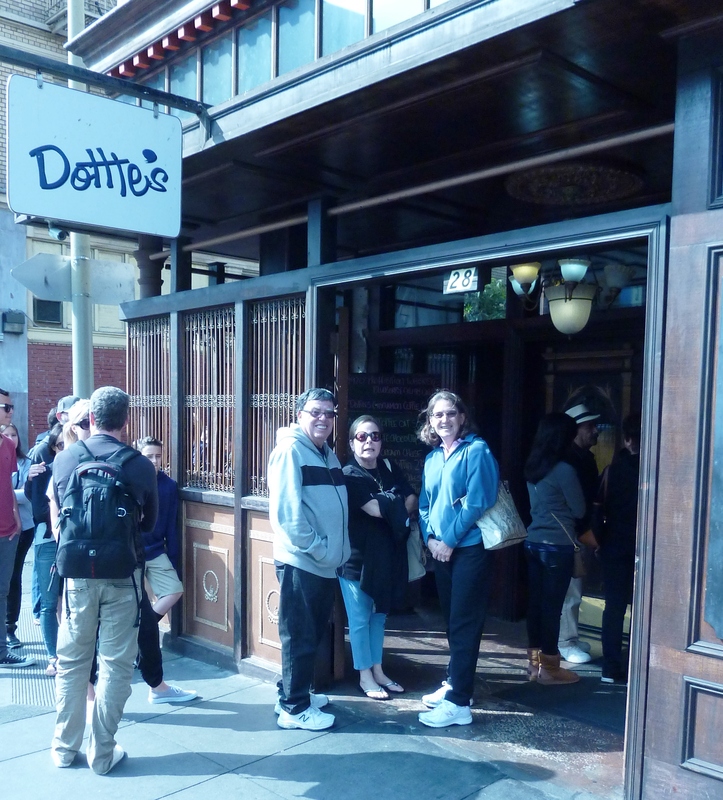 I said something like, “Dorothy’s on 6th.” Jen screamed, “Dottie’s True Blue Café.” Jen first saw the place in 2007 when a group of women from the Nike Women’s Marathon * San Francisco stood in line waiting to eat at Dottie’s old location. It took her until this past June to get back and actually eat there. It’s now one of her favorites.